One of the best things about this Central Coast Tour is the food! We don't miss any opportunity to dine at our favorite eateries. After getting cleaned up from a fun day at the beach we headed out for dinner. 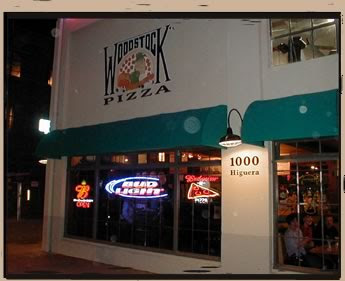 Woodstock's Pizza was our destination. They hand make all their pizza dough. The kids love to watch them flip it around in the air and spin it into a perfect round crust. They have a signature fold for the crust that packs in more sauce so there is no need for dipping. My personal favorite is their dessert pizza. It now comes in 3 different flavors, but the original cinnamon and sugar with frosting is the best. Oh boy, I'm salivating right now just thinking about it. If you've never been there - then get there! My parents (we found out, had planned their own trip to the coast so we thought it would be fun to get together while there) and Jeremy's parents (who had decided to make a scenic road trip down the coast in their new corvette) met us there and it was fun to hang out with them for dinner. After dinner we walked down and around the corner to see the vacant restaurant that Kelly has picked out for her own bakery shoppe. * I like to call it Kelly Kupcakes or Kupcakes by Kelly (This is all purely dreaming, but still fun none the less.) It was such a cute place with windows that fold out and open to the street. The display cases were already in place and there was also a bar - not for alcohol, but for a choose-your-own-cupcake counter. You choose the flavor, filling, frosting and toppings. What a great idea! *Kelly is not really opening a cupcake shoppe. We just like fantasizing about our ideal careers after the kids are grown. And opening a shop like this would tickle her fancy! So after a moment of dreaming about cupcake heaven we hurried back to our cars to get to the drive-in movie. Our kids have never been to the drive-in. All the theaters around home have been closed down for years so this was a fun experience for them. We brought lots of chairs and blankets (and some snacks that we didn't even touch because we were all stuffed from dinner) because it was chilly outside - we were at the coast after all. 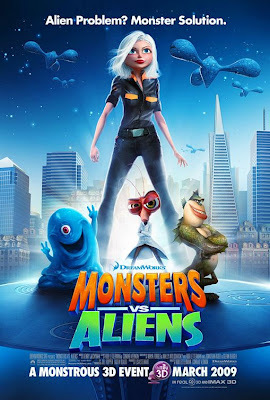 The family feature film that night was Monsters vs. Aliens by Dreamworks. We all got a kick out of this show. It had some great lines about Fresno in the very beginning. Jeremy fell back into his high school days and called out, "Go FRES-NO!" for all the movie goers to hear. I think someone else may have echoed his shout out. The movie itself turned out to be pretty good. I am a Reese Witherspoon fan so it was fun to hear her do a character's voice. It was fun trying to pick out all the other famous voices in the cast too. Jeremy and I got a huge kick out of Stephen Colbert playing the president of the US. He's a riot! And hearing Kiefer Sutherland's southern accent was equally entertaining. If you have kids and want to be entertained with several funny moments then this movie is for you. We gave it 4 "Hail Gallaxhar"s out of 5. How fun! That's exciting that Kelly is opening a cupcake place. Everyone loves cupcakes.